Here comes the story of the most universally respected unknown jazz pianist from the 1950s. If you think there’s a heady mix of oxymoron and rarified obscurantism there, you might just be right. But there’s also some pretty fine music hiding in Herbie Nichols’ miniscule oeuvre. 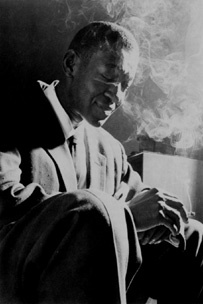 Herbie Nichols (1919-1963) grew up in Harlem, studied a bit of piano at CCNY, served in the army (where, unable to play music, he turned his attention to reading and writing poetry). After the war he bounced around musically, playing in everything from Dixieland to Rhythm and Blues settings in order to pay the bills. He liked to hang out in public libraries and died at 44 from leukemia, a bachelor. His only public exposure worth mentioning was when Billie Holiday added lyrics to his song ‘Lady Sings the Blues’, making it a signature song of hers and title of her autobiography. But I’m guessing that didn’t pay a lot of Herbie’s bills. By the time Diana Ross got to it, he was long gone. Here’s Lady Day’s version, and here’s Herbie Nichols’ original. After years of pestering Alfred Lion at Blue Note, they finally agreed to let him record a couple of sessions in 1955 and 1956. 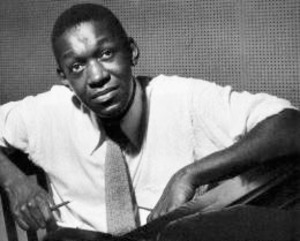 They were trio sessions (it’s widely assumed that Nichols envisioned a richer setting for his very complex music), but he did have the gift of excellent bassists (Al McKibbon and Teddy Kotick) and legendary drummers (Art Blakey and Max Roach) accompanying him on these sessions. He recorded once more in 1957 with a smaller label, backed by George Duvivier (b) and Mingus’s Danny Richmond (d). This session has the best title of anything ever: “Love, Gloom, Cash, Love”. His music is ambiguous, filled with warm dissonances and subtle rhythmic twists and harmonic turns. There’s a pervasive sharp intellect tempered with great warmth and a lot of resigned humor. He saw himself not as a jazz player but as a composer. 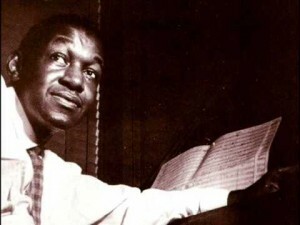 “My earliest ambition was to become a Prokofiev, but later decided to become an Ellington.” Jazz is widely perceived to be a fundamentally improvised medium, but there’s a rich tradition of composed jazz, which I frequently find riveting and to which Nichols belongs. The guy even scores the drum parts! He’s as much influenced by primitive African rhythms as he is by Bartók’s harmonic aesthetic. “I keep remembering that the overtones of fifths created by the beautiful tones of any ordinary drum was surely the first music, the precursor of the historic major scale, no less, which was built on the same principles. That is why the cycle of fifths is so prevalent in elemental jazz.” Hmmm. 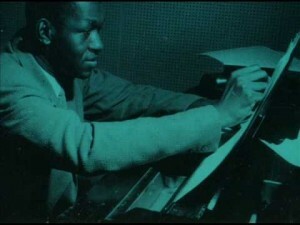 Herbie Nichols’ music is often compared with that of Thelonious Monk (1917-1982). They’re roughly contemporaries, both with strong roots in the bebop movement, sharply angular, brilliant, humorous, inimitable. But whereas Monk was quirky, self-absorbed in his personal life and in his music, Nichols comes across as a really nice, normal guy who never got the break he deserved, the prototypical neglected genius. His music, for all its complexity and intricacy, is really quite fun. Monk finally achieved his recognition as a bona fide genius after languishing in obscurity for decades. Herbie continues to languish, despite a rabid cult following struggling to keep his musical legacy alive. One musician on whom Herbie clearly has had a great influence is another favorite of mine, Andrew Hill (1937-2007), to whom I promise to devote his very own SoTW. Check out ‘Pumpkin’ from “Black Fire”. Strong melody line, enticing but elusive. The big difference is Herbie’s good nature and warmth, as opposed to Hill’s very dark, lunar landscape. In the early 1980s, Dutch avant garde pianist/arranger Misha Mengelberg got together a bunch of like-minded musicians (including Roswell Rudd and Steve Lacy) to cast some Nichols compositions in a medium-sized group. Here’s their stellar take on ‘House Party Starting‘, from their album “Change of Season”. And here’s Duck Baker, a real fine acoustic fingerpicker, doing his version of ‘House Party Starting‘ from his 1996 album of solo guitar Herbie Nichols covers, “Spinning Song“. Here’s Steve Lacy (soprano sax) and Mal Waldron’s (piano) 1994 version of the song from the album “Hot House”. I’ve written about this duo before. They’re incredible – intense, lyrical, brilliant, passionate, and I just love them both to death for making such beautiful music. This cut, Lacy’s mournful soprano sax the perfect voice for Nichols’ grin-through-it-all irrepressibility, just bowls me over. The way his straight horn elicits the melody, the sweetness from the original. Oh, my my. 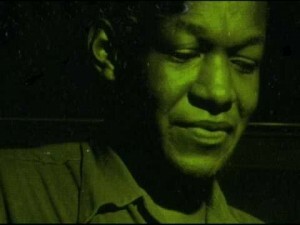 In 1994, pianist Frank Kimbrough and bassist Ben Allison formed a floating group of highly respected avant garde jazz musicians called “The Herbie Nichols Project” to promulgate his ‘lesser-known compositions’ (yes, they really said that) and to couch them in a setting with horns, which the composer never had the opportunity to do in his lifetime. They’ve recorded three albums, titled after the Nichols’ songs “Strange City”, “Dr. Cyclops’ Dream”, and “Love Is Proximity” (they deserve a prize for album titles). But we’re not going to deny Herbie a chance to stand in the spotlight. So here you go folks, Mr Nichols himself playing his composition ‘House Party Starting’, backed by McKibbon and Max Roach. It’s a wonder of ebullience, wit, panache and taste. Ladies and gentlemen, a moment of your attention please for the most famous unknown jazz pianist of the 1950s, the wonderful forgotten but unforgettable Mr Herbie Nichols. Heck, you could even invite some of your friends over to listen to him. You could start a house party. Here are some more YouTube clips of Herbie for your further listening edification: ‘Sunday Stroll‘, ‘Infatuation Eyes’, ‘The Third World’, ‘Applejackin‘, ‘Love, Gloom, Cash, Love‘. That was great. House Party Starting and the links to all the related songs – all of them great. Put me in a good mood for Purim. Thank you. Thanks for pointing out The Herbie Nichols Project. but wasn’t aware of this tribute project – I like their general sound! Thank you for highlighting this most interesting and unique composer/player I’ve never heard of. I agree on the Steve Lacy/Mal Waldren cover, this elusive tune is discovered beautifully.